As many of you will know I am an archaeologist by profession, and have spent much of my working life engaged in archaeological and historical analysis of the Irish military experience. I have been fortunate to examine many different areas over the years, be it Elizabethan-era battlefields, 17th century massacre sites, 19th century military fortifications or 20th century memorialisation and remembrance. It has been pretty clear for the past four years or so that the Irish experience of the American Civil War has utterly captivated me. I feel a need bordering on obligation (maybe obsession?) to explore, understand and disseminate the experiences of these Irish emigrants in as many ways possible. To that end I have recently embarked on a part-time PhD at nearby University College Cork. Carrying out detailed research while still working is a challenge, but I felt the time was right to formalise and focus my study of the Irish in this period. If all goes to plan it will take me some six years to complete (of course, completion is by no means guaranteed). As someone who spends much of their time dealing in online history, it seems appropriate to undertake the degree as part of a structured Digital Arts & Humanities programme, which has a stated aim of enabling students to ‘carry out research in the arts and humanities at the highest level using new media and computer technologies’. I am based in Ireland, thousands of miles from many of the major relevant historical repositories, so it is true to say that without computer technologies I would never have been able to explore the American Civil War in anything like the detail that the digital age has made possible. Therefore it seems appropriate that part of my work is focused on the further use and application of these tools when it comes to the Irish experience of the Civil War. So what exactly am I going to be looking at? Even a cursory glance through the history of the posts on this site will see how it has become centred on the social impact and consequences of the war, told through ‘personal stories.’ It is still early days in the formulation of my research questions and thesis outline (so expect some changes!) but I want to work on assessing the real cost of the war for individual Irish people. When a few dozen men were killed or maimed at a particular battle, what were the consequences of that event in the years that followed? What was the psychological impact on men and their families? What type of pensions and supports did they receive, were they adequate? How did they remember their experience in later years? My most probable focus will be on the men of the New York regiments of the Irish Brigade and their families (63rd, 69th, 88th New York) but this may narrow and expand depending on developments. When I have finalised my thesis outline in the coming months I hope to launch an appeal on the site, asking you the readers if you have any primary source material relating to relevant men and their families that might contribute to this analysis. My work will also require a digital component, and aside from digital analytical and visualization tools that I hope to utilise, I am also keen to continue a process of dissemination and collaboration with others interested in this area (which to some extent this blog facilitates). Ideally I am hoping that I can create a new interactive resource that will be freely available to all and will be based on the above research. We will have to wait and see if that can become a reality. There is much work yet to do, and it would be naive of me to think that this work will not impact on the frequency of posting on the site. However, I do intend to maintain it as an integral part of my research and I also hope to post the occasional update on progress. A daunting road lies ahead, but I do hope it proves to be a fulfilling one! Great! Keep us informed. Kevin Levin found that the input from his web site helped him with his book. Just don’t let it interfere with your research and writing. God Bless You Damian and I am sure that you will excel. Go for it!. Will be looking forward to Hearing from you. Will wait for updates. Many thanks for your sentiments! Great stuff, Damian. Letters to local papers in NY State (& elsewhere) asking for help when the time comes would probably be a good start. There are many smaller local papers that might be useful. Thanks for that that is a really good idea and something I will certainly look to do- I am convinced there is a lot of very interesting material out there! I too am working on a Ph.D. The focus is Fort Yellowstone. 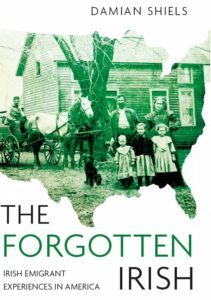 By the way, your wonderful blog has encouraged me to emphasize immigrants when I cover the Civil War in U.S. History. That sounds like a fascinating topic for a PhD! It is really great to hear that the blog has had that impact for you, hearing positives like that makes it a worthwhile endeavour! I’ve learned loads reading through your work Damien and it’s been a pleasure to help a few others find you too. Continued success with all your endeavors, it’s great to be connected in with you. Many thanks and likewise! Also thanks for all the help to date I really appreciate it! This is wonderful news. I’m on the genealogical side of this looking to see if a great grandfather did, indeed, serve in the Civil War. My only clue is his marriage record from Brooklyn, Kings, NY, USA, listing his residence as Fort Hamilton. Anyway, there are historical societies that may be of help, but also you might want to look into local re-enactment groups. There are several throughout the country, and NY might have some, too. The re-enactors delve into the history of their regiment, etc. The Civil War Archives should also be a great source of info for you. Quite the project, but it will be beneficial to a countless number of people. Many thanks! What was your great grandfathers name? Thanks also for the advice they are some good suggestions! Many congratulations. I’m sure you will succeed. My father got his PhD from Columbia in his early 40s while working full time in a demanding professional career and being married with children. So it can indeed be done. I’m sure you’ve thought of it already but when you’re ready, you might post your queries on every NY Irish and Civil War online forum. You are right that there are a lot of great untold stories out there. Thanks Virginia! Also good advice re the forums- another avenue I hadn’t considered so I will certainly look at that! Thanks for the support! There certainly were quite a number of connections between Massachusetts and some of the New York Irish Brigade regiments that will be worth exploring, so watch this space! HI Damian , just finished reading Stonewall of the west, why do think P Cleburne is not better known in Ireland.also where is placed Southern History. Many thanks for the comment. I think there are a number of reasons for it- Irish veterans of the American Civil War tend not to be remembered to the same extent as others (e.g. from World War One) mainly because the majority didn’t come home and as a result their descendants are by and large in the U.S. today- people often have more of an awareness of history when they can view it through the lens of their own ancestors experience. Also in terms of the famous Generals etc. those that remain well-known in Ireland are largely so because they had connections to Fenianism or were ‘exiles’- e.g. Thomas Francis Meagher- even in these cases they are more famous for their activities in Ireland or directly related to Ireland then what they did in America. As Cleburne was not a Fenian and did not comment widely on Ireland during his time in the U.S. this partly explains it. I have written a few posts about this topic over the years- it is a really fascinating aspect of Irish memory and raises questions about how we in Ireland remember our history and our diaspora generally. Excellent, keep us updated. I look forward to reading the final product in 6 years. were filled with hate for them? Many thanks for the comment. That is an interesting poster- it is using one of a number of statements that recruiters employed to recruit the Irish of New York. I have looked in detail at one of Meagher’s speeches (which I go through in detail in my book- shameless plug!) and this is one of the things he alludes to. The argument put forward was that the Southern Plantation society had developed into an aristocratic society similar to what many Irish had experienced in Ireland- i.e. a landlord class, and that this was not what the Irish were interested in seeing perpetuated in the republic. In addition to drawing parallels between the British landowning class in Ireland and Southern plantation owners, they were also pointing out that Britain was sympathetic to the South (at least in the wars early years) and were tantamount to their allies, so striking at the South was a way of striking at Britain. Of course it is impossible to gauge just how successful this was as a recruiting tactic, and many other reasons were also put forward as to why the Irish should fight. For what it is worth I think for those ideologically motivated the main reason they fought was the preservation of the Union and republic (something which was in their interests for numerous different reasons), while for others economics was an important factor.